Dundee United have signed Dutch midfielder Rodney Sneijder on a two-year deal. The 24-year-old younger brother of Galatasaray midfielder Wesley joins as a free agent after being released by Almere City in his homeland. "He has a fabulous pedigree and you can see his talent," said manager Jackie McNamara of the former Ajax youth. "He will become a fans' favourite at Tannadice and this signing is a real coup for the club." Sneijder played as a trialist in two matches for the Scottish Premiership side on their pre-season trip to the Netherlands but did not feature in Saturday's 1-0 friendly loss to Watford at Tannadice. "I enjoyed my time with the squad over in the Netherlands and I know from speaking to the manager where he believes this team can go," he told the club's website. "This is an excellent opportunity for me to develop and progress as a player. "This is the right time for me to explore Scottish football and I look forward to meeting my new team mates and the Dundee United fans. I want to help the club achieve success this season." Former Ajax, Real Madrid and Inter Milan star Wesley wished his brother well. 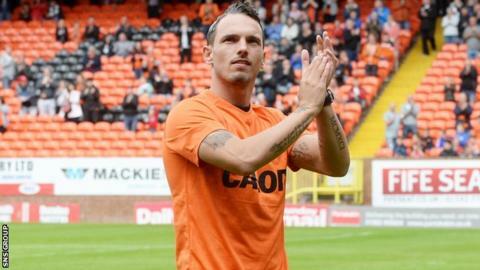 "Congratulations and good luck @rodneysneijder at @dundeeunitedfc #brother #newclub #scottishfootball," he wrote on Twitter.